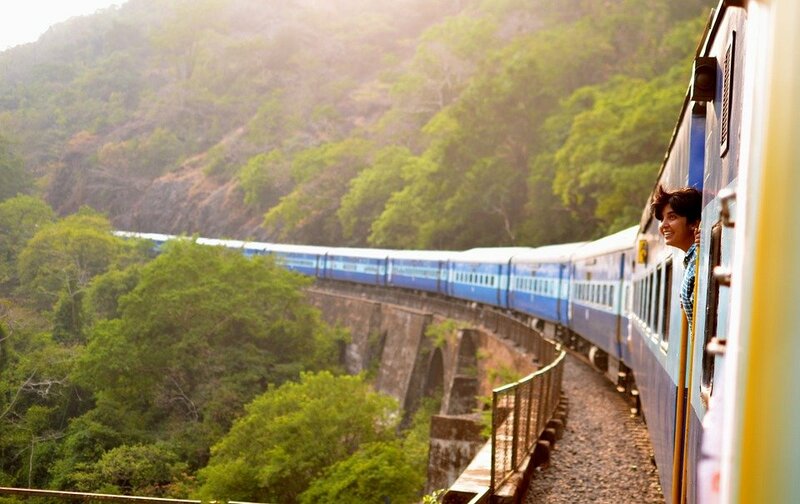 Trains from Bangkok to Nakhon Si Thammarat pass through the busy stretch of Thailand’s Southern Railway Line, stopping on route at popular destinations such as Hua Hin, Chumphon (for Koh Tao) and Surat Thani (for Koh Samui and Koh Phangan). Trains get noticeably less busy in the 1st and 2nd Class for the final section of the journey from Surat Thani to Nakhon Si Thammarat. There are two direct train services a day from Bangkok to Nakhon Si Thammarat. 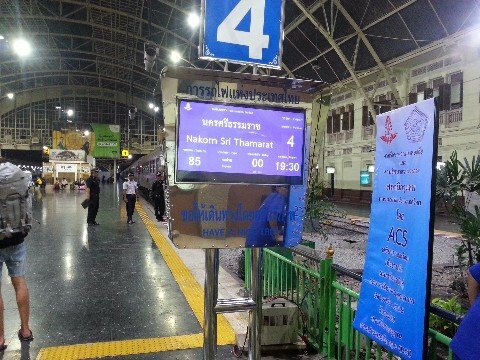 The fastest train service between Bangkok and Nakhon Si Thammarat is Train #85 which is scheduled to complete the journey in 15 hours 25 minutes. The slowest service is Train #173 which is scheduled to arrive in Nakhon Si Thammarat 16 hours 20 minutes after departing from Bangkok. Sleeper berths are available on all direct train services to from Bangkok to Nakhon Si Thammarat. Use the Search Box below to find your tickets from Bangkok to Nakhon Si Thammarat. Simply enter your travel dates and click to Find Tickets. See below for information about the cost of booking train tickets online in Thailand. Tickets available for collection in Thailand or sent by post to your home address. All seats types are available on this journey. You cannot book 3rd Class train tickets from Bangkok to Nakhon Si Thammarat online but you can book 1st and 2nd Class Air-Conditioned Sleeper Seats online as well cheaper 2nd Class Fan Sleeper Seats and 2nd Fan Sleepers on Train #173. For best seats it well worth booking in advance. Train tickets purchased online from Bangkok to Nakhon Si Thammarat are 250 THB more expensive than train tickets purchased at the train station. 2nd Class Air-Conditioned Sleeper Seats are near identical to 2nd Class Fan Sleeper Seats except for method of climate control in the carriage, and it is worth noting that if you book a lower bed in a 2nd Class Fan carriage you can usually open the window allowing in the cooler air. Upper bunks in 2nd Class Fan carriages, however, can become very hot and uncomfortable. Whilst Nakhon Si Thammarat is not itself a particularly popular destination, both Trains #173 and #85 pass through Chumphon (connection point for ferries to Koh Tao) and Surat Thani (connection point to Koh Samui and Koh Phangan) on the way to Nakhon Si Thammarat which means that the train can become very busy during high season and around the time of the monthly Full Moon Party on Koh Phangan. Wat Phra Mahathat Woromaha Vihan: Dating back to 845 AD this is the largest and most important Buddhist temple in Southern Thailand notable for its Buddha relics and 174 chedi. Sichon Beach: A relaxed beach destination with some great hotels and beach front fish restaurants well of the beaten track for foreign tourists although quite popular with Thai holiday makers. Sichon can be reached directly by minivan from Nakhon Si Thammarat, but not from Surat Thani. Khanom: A relaxed seaside resort featuring 9 km of beach front catering mostly to Thai visitors. The most popular part of Khanom is Nai Plao Beach. The area is famous also for its pink dolphins that inhabit the local coastal waters. Other attractions in the area include Khao Wang Thong cave, which is 17.5 km from Nai Plao beach. You can reach Khanom by minivan from Nakhon Si Thammarat Bus Station in around 1 hour 30 minutes. Minivans depart regularly throughout the day. Train #85 is by far the best train direct train from Bangkok to Nakhon Si Thammarat. Train #85 has a full range of 1st and 2nd Class Air-Conditioned carriages, as well as fan carriages. Train #85 also uses newer carriages which are in better condition than the carriages used on Train #173, which is why tickets on Traiin #85 are slightly more expensive than tickets on Train #173. It is possible to transport motorbikes and bicycles on both Train #173 and Train #85 from Bangkok to Nakhon Si Thammarat if there is space in the freight carriage if there is room. For more information see our Guide to Carrying bicycles on Thailand Trains. Bangkok’s main train station is known locally as Hua Lamphong Station. Meter taxis are cheap and plentiful in Bangkok although depending on where you coming from, and the time of day, you may find it easier to use public transport to reach Hua Lamphong Station which is located in Bangkok’s busy China Town because of congestion on the roads. The fastest form of transport to Bangkok train station is the Metro system (MRT). The BTS (skytrain) connects with the MRT at several stations as does the Airport Link from Bangkok’s Suvarnabhumi International Airport. from the Khao San Road area of Bangkok you can also travel to Hua Lamphong Station via the Chao Phraya Express Boat. The nearest Chao Phraya Express Boat pier to Bangkok Train Station is Pier Number 4 (the Marine Department Pier) which is a 1.2 km walk away. Nakhon Si Thammarat train station is located 3.5 km by road to the North of Wat Phra Mahathat Woramaha Vihan. 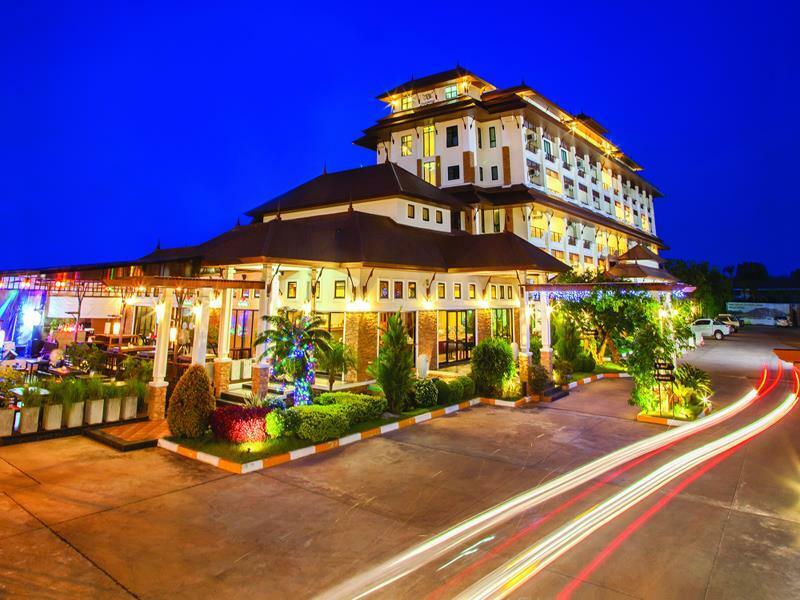 Next find out What to do for a day in Nakhon Si Thammarat?